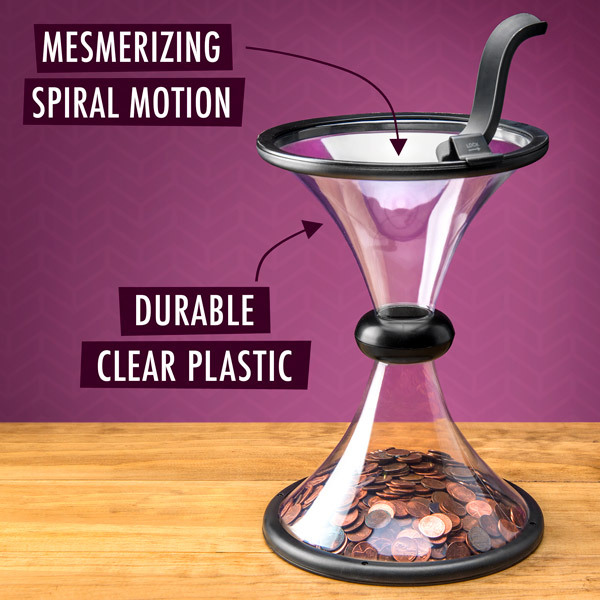 Vortex Bank is a desktop version of the popular coin collectors that have mesmerized generations of children. Place your coin on the attached ramp and watch as it uses centrifugal force to seemingly defy gravity. 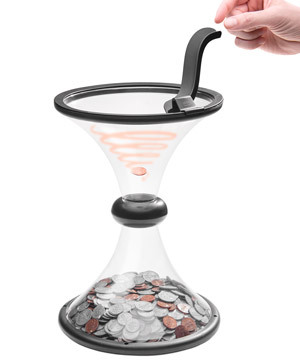 Instead of falling straight down, the coin spirals around the hourglass-shaped Vortex with increasing velocity before being deposited into the bottom half of the bank. You can drop one coin at a time or add a sofa’s worth of loose change to create a tornado of currency. 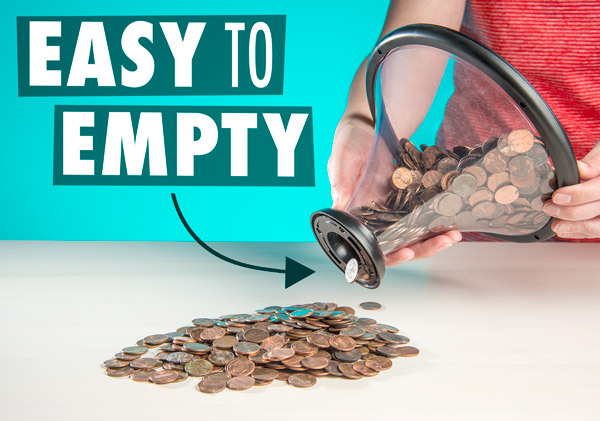 Soon after getting Vortex, you won’t have to worry about keeping track of your loose coins; you’ll know you already used every cent you could get your hands on to create a fascinating demonstration. Don’t throw your money down the tubes; throw it down the Vortex Bank and have fun watching the savings pile up. The detachable ramp at the top of the bank ensures that your coin enters the top cone with the correct angle and velocity necessary to preserve its centrifugal motion. Although the bank utilizes well-understood principles of physics, science still can’t explain why it’s so mesmerizing to watch. If only contributing to your Roth IRA was this exciting. There’s no better savings plan than a good education. Combine the two when you save your money in the Vortex Bank. The transparent plastic sides allow you to see your coins get deposited so you can track your saving efforts. When it’s time to cash in your coin, the two halves of the bank detach for easy emptying. It’s much cleaner than smashing open a piggy bank. Watch your savings spiral out of control. Whether you’re using the Vortex Bank to teach a child about science or just want a distraction at work, you’re sure to enjoy using the desktop display. Use it to herd your loose change or have fun experimenting with different sized orbs. If anyone accuses you of spending too much time watching it, just tell them you’re learning about decaying orbits… and then go back to having fun. Create a mesmerizing monetary display. Question: Can I use non-U.S. coins in the bank? 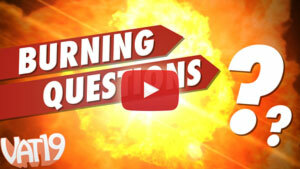 Answer: Yes! The Vortex Bank can be used with any currency that can fit in the ramp (which is large enough to accommodate most coins). Question: Does it work every time? Answer: Occasionally your coin will enter at a weird angle and fall straight down, but overall it’s remarkably consistent.